Have you ever heard a TV preacher, a political commentator, or a teacher of some sorts start to criticize a particular way of thinking and right away you know they are talking about you? As I write this I am listening to a sermon by a man named Ergun Caner from Liberty University. He is talking about "scratch and sniff" spirituality or "new aged" spirituality. He has not really defined what exactly this spirituality is but he used phrases like "group hug" and "touchy feely" to describe it. He criticizes those who see biblical interpretation as largely a matter of opinion, people who believe that we should be in open dialogue about biblical interpretation. He seems to believe that we should be able to say "THE BIBLE SAYS" as a matter of fact and that if we currently attend a church where our pastor uses words like "in my opinion" or "it seems to me" (a phrase which Paul himself used 1 Corinthians 4:9) we should relocate and find a church where the pastor preaches the word of God, assuming that if it's your opinion then it must not be the word of God. He criticizes a plurality of perspectives calling them "stupid" and "idiotic" making it very clear that he was not interested in hearing these perspectives out and opening a dialogue with those who hold them. It seems to me that he believes that he has crossed the threshold of opinion and interpretation and that now when he reads scripture he is not interpreting it at all but just reading it as a matter of fact. He seems to think that Biblical exegesis happens in isolation and not in conversation, that you don't need to hear what anyone else thinks but you should just be able to read the bible for what it says and it will still have meaning. And in my opinion it's ironic for him to say that the sort of faith which is still interpreting and still holds "opinions" with some sensitivity is shallow. His black and white, true or false, "THE BIBLE SAYS" spirituality is apparently much deeper (and it must be because his opinion has nothing to do with it). His is the absolute interpretation. If Dr. Caner is right and open mindedness is "idiotic", if he is right and humility in interpretation is "stupid" then I must be an idiot and I must be stupid, in fact I must be shallow, because I don't think I will ever be arrogant enough to say that my understanding of scripture is the only absolute understanding. For me to agree with Caner I would have to forget everything I know about hermeneutics. I will not begin to assume that I can or should want to reach a realm beyond interpretation, as long as my thoughts are happening in my head they will always be subjective and they will always be my interpretations. I will always be open to hearing other people and to allow their life and interpretation to give flesh to my understanding. I can't help but believe that the word of God is incarnational and alive, not rigid and absolute. Having said all this... in my opinion Jesus Christ, immanuel, is our only hope for salvation. It seems to me that the only one who can save us from the curse is the one who created us and became the anti-curse and the example we must follow. I say this confidently and I will gladly argue it and explain it, in fact I will even correct you if I think you are wrong but, nevertheless, it's my interpretation. I cannot use it to manipulate you, exploit you, and I cannot hold it over you but I can invite you into it and into the kind of life to which it leads. 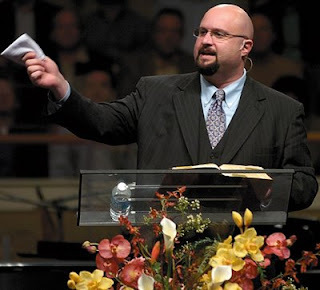 Ergun Caner is the President of Liberty Theological Seminary at Liberty University in Lynchburg, Virginia. "I cannot use it to manipulate you, exploit you, and I cannot hold it over you but I can invite you into it and into the kind of life to which it leads." May we never forget that this is the heart of Jesus. May we never forget this, Wesley. It's no wonder that people like him cringe when they are confronted with the latest biblical scholarship that legitimately challenges many of their "sacred" interpretations of scripture (e.g. Pauline New Perspective, ANE studies on Gen 1-11, etc.). They made up their minds years ago what the bible means and they won't be confused with any new findings. And just because we disagree with Ergun, doesn't mean we believe all biblical interpretations are treated the same. It simply means that we operate under a chastised epistemology as finite and fallen creatures. Good blog, btw. I'm a fellow San Diegan, so I'll try to drop in from time to time. Thanks for your thoughts. I especially agree with "just because we disagree with Ergun, doesn't mean we believe all biblical interpretations are treated the same." I think we still have room to disagree with people and even correct people but we don't have room to say that we have the absolute truth over against someone's opinion. I hope you do drop by now and again, it's nice to know there are others here in SD who might be less inclined to call me a heretic.